Damned if you do, damned if you don’t.. | Through the seasons before us..
Damned if you do, damned if you don’t..
I’ve been keeping half an eye on the developments of the film version of The Damned United, in which Michael Sheen will take the role of Brian Clough (or rather, David Peace’s caricature of Brian Clough). Whilst upon reading Peace’s book I did review my overly negative prejudices towards it, it was a terribly one-dimensional portrayal of somebody I regard as a bit of a hero – but naturally, the film is of great interest too. The cast list looks very well considered, the trailer looks good (see below), and I must admit I’m looking forward to it. Rather than watch Derby play United, I’ve been randomly browsing around the internet and found the trailer to the film, which had somehow passed me by until now, which rather inspired this blog post somewhat! Check out the trailer below, football is generally something that doesn’t translate to the big screen (aside from maybe in the context of live footy in the pub!) – this does promise to do a bit of a better job. I’m glad I resisted the urge to go along to their casting sessions for extras, as obviously the drawback from a Forest fans point of view is that the story of The Damned United is essentially a fanciful documentary of his pre-Forest days – and any role as an extra would more than likely have been as a Derby fan, well no thanks to that, not even in make-believe and with the promise of an appearance on the big screen! The film, much like the book, looks interesting. 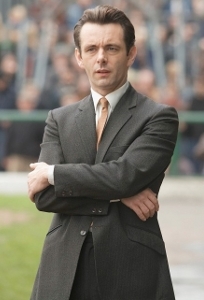 From clips of the trailer it looks to have at least some moments of light-heartedness which are almost wholly absent on the pages of the book – having seen Sheen take on other roles, he’s a talented actor, as is the strangely prolific Spall in taking on Peter Taylor. Colm Meaney as Don Revie could prove to be an inspired choice as well. 27th March is the release date, I doubt I’ll resist the urge to pop along to the cinema to check it out, caricature or no caricature, overly-negative or not, it does look like it will make a cracking film. Oh, and I just had a text message to say that Manchester United have just scored – rarely does that make me smile, it does today! Yes, they have just scored… a consolation given that I am watching the game on Greek national TV fuming about what could have been……..
Man Utd have just had a goal disallowed (bull***t), but the trailer was great. Even though the movie is not about Forest I would love to see it. The Clough and Taylor characters are absolutely hilarious. sheep 0 united 3 and i suspect more i hope they get thumped im listening on radio. Sheep 1 Utd 4. Why do I think we would have provided a much better opposition? Really Vassilis? Really? As much as it pain to say so, Derby are a much better side than we are in all areas apart from pace. The trailer does make me want to go and see the film even though as you say it is about the sheep. Perhaps a sequel is on the cards? Lets face it, his success at Derby was nothing compared to what he did at Forest, or was this all about his failing at Leeds? a – Nothing can beat a Cup run or pay-off vs Man Utd. Man Utd were more prepared this time for the match (considering it’s the 3rd time they’ve met). Shame it weren’t more 😆 & I agree with Vas, we’d ‘ve given ’em a better match as the Kids will be more up to it then those Sheep!! Sorry guys i totally agree with lee derby are a much better side than us at the moment.They gave us a doing at the city ground it paines me to say it. At 2 up we should have tied it up but we bottled it again.And we are also on the slide again and i personaly fear for us at the moment. To be honest I wasn’t going to give this film the time of day, but it may be worth a look on the basis of that trailer. Yep, a stronger, more experienced side got thrashed at home by Manure. Our inexperienced youngsters might have taken a pounding that could’ve wrecked the season. Despite what people have said, the book was very good, albeit a bit too full of profanities that I don’t reckon Clough would of used so often. read the book a while ago and found it heavy going, funny bits aside like burning revie’s office desk and chair outside elland road, didn’t quite seem right reading negative things about the great man. saying that it’s a film i wont miss even if i get it off my local “knock off nigel” earlier than the cinema’s get it !!! !